Solution: Install a Venstar Add-a-Wire adapter! If you are lacking the (ironically named) “common wire”, also known as the C-wire, you might be pleased to learn that there’s an adapter for that. 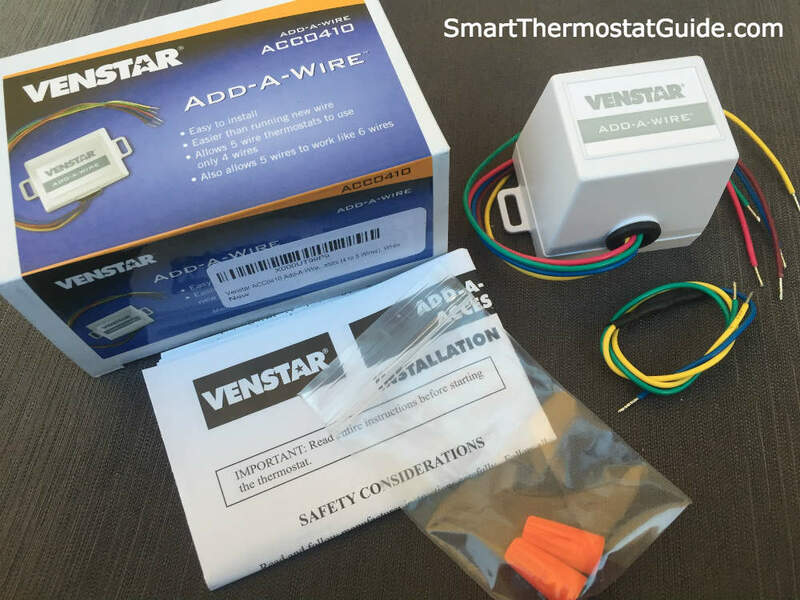 The Venstar Add-a-Wire is an inexpensive, DIY-friendly alternative to running completely new HVAC wires. 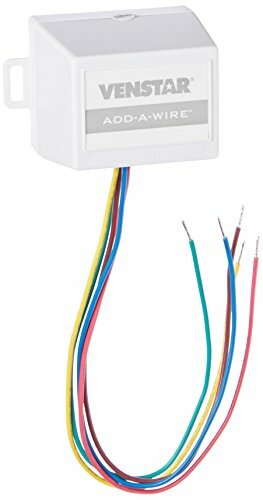 From the manufacturer: In applications where additional wiring cannot be run to your programmable digital thermostat, the Add-A-Wire accessory can be used to add a wire to the thermostat. In short, Wi-Fi thermostats need more power to run that always-on Wi-Fi connection. The C-wire a common wire that delivers a continuous flow of electricity to your thermostat. Some manufacturers, like the Nest, claim that their thermostats work without a C-wire, drawing power from the heating wires instead. Unfortunately for many homeowners, the outcome is an intermittent WiFi connection or unwanted furnace cycling. Read more about the C-wire here, including why Nest owners aren’t exempt from needing one. If you have a low voltage HVAC system, you can skip some of the hassle if you select a thermostat that works without a C-wire or ships with an adapter. 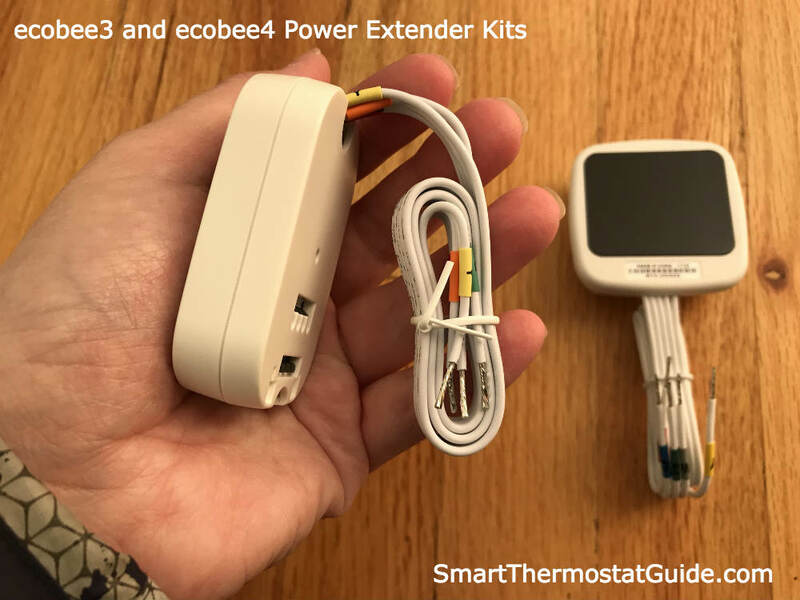 All ecobee thermostats ship with a super handy “power extender kit” (PEK for short). In the photo below, an ecobee3-style PEK (in my hand) and an ecobee4-style PEK (in the background). They are functionally identical. If you’re not sure what you have or what to do with your wiring, check out our full guide to the C-wire. Adding an adapter is not difficult: if you’ve ever installed a ceiling lamp or replaced an electrical outlet, you’ve got the skills and tools for adding this adapter. Most of the work is in twisting wires together and matching colors. Installation takes first-timers about an hour, start to finish. Instructions are included with the adapter. The furnace end of the Venstar Add-a-Wire adapter installation process. You will need access to both your furnace wiring and your thermostat wiring. You’ll be installing new wire parts at your furnace and behind your thermostat. Expect a little ambiguity as your furnace panel will invariably vary from the one shown, but anyone savvy enough to install the thermostat itself should be able to handle this project. We highly recommend the Venstar Add-a-Wire adapter. It’s much cheaper and easier than running new HVAC wiring, can be done by almost anyone in about an hour, and well-reviewed by other buyers on Amazon.com. I have three wires in my existing progammable thermostat and want to upgrade to a wifi thermostat. I have wires connected to W, Y and R (linked to Rc). Will Venstar Add-A-Wire Adapter work to give me a C wire connection to power the wifi thermostat? Good question! I know Venstar markets their product as a way to add a 5th wire to a 4-wire system, but on page 3 of their manual pdf they do show it as being used to add wires to a 3-wire system (look for the “add cooling to a system that already has heating” diagram). However, all these diagrams assume there’s a blue wire, which you don’t seem to have (unless you do and it’s connected to one of your other-letter terminals). If you do resolve it, please come back and let us all know how it goes! Good luck. Thanks for your posting. I have four thermostats for four zones. Only one of these controls the AC and it has a blue wire. However, I won’t be using this location for the WIF thermostat, but one that only controls heat and has the three ires I noted above. In fact, I want to install two WIFI thermostats at different zone locations. I’ll email Venstar with this info. So I just hooked up my new Nest Thermostat (2nd Gen) and got rid of my old “stupid” thermostat. Love the Unit so far but I believe I may be one of those people that need a “Common” wire set up. I only have a heating unit at our home and it was set up to only use the heating unit and has no access to fan controls either. Very basic but has worked fine until I hooked up the Nest. I only have a 2 wire system at the moment and use “W” & “RH”. My unit powers up and is able to control the heating but my issue now is the fact that when I go to set the Nest @ 70 degrees and my house is currently @ 61 I cannot keep the unit running consistently as I now get “Delayed for 2min. 30 seconds” on my Nest display. So basically now the unit will heat up, fuel system will shut down and enter it’s “cool off” period and before the “delayed” time is over the system shuts down only to re-light the pilot and start up again and do this process over and over again until my desired temperature is reached. Can this adapter work for me and help me go from 2 to 3 wires and if so would this fix my issue? I only have 2 wires running from the Furnace as far as I can see. Looks like garage door wiring actually. The unit is newer and whoever installed basically cut the old wire at the wall and used the existing 2 wire to splice into to run a few extra feet. Though a bit more money, I decided to try the Nest. The website and compatibility check said it would work without a “c wire”. I confirmed this by calling their toll free number. I installed two of these yesterday and they seem to be working fine. Your two wire set up should also work. Call their toll free support number. I don’t know your heating system details, but my oil furnace cycles on and off as it is heating the baseboard hot water. When the hot liquid reaches a certain temperature the furnace cuts but the liquid keeps circulating until the set temperature is reached. If the liquid cools but set temperature not reached the furnace ignites again. This cycle continues until the set temperature is reached. Your best bet is toll free support. I, too, only have 2 wires (and no common wire). What I found is that it ran fine, for a few days, then my furnace started acting funny, e.g., when Nest was in “heating” mode, my thermostat would sometimes stay off, and just make clicking noises. Other times, the fan would turn on and off, every 2 seconds, over and over and over. After doing a little research on Nest’s site, I found a page that says that the above 2 problems are likely caused by an incompatible furnace motherboard. Since the Nest is stealing power from the motherboard, to charge itself, some motherboards start acting strangely. The only solution is to wire new furnace wire (that includes a common wire). No way to avoid it. They usually deal with using electricity for transmitting energy. I have a heating system with just a W and R wire, can i use this to add a C wire for a wifi thermostat? Has this product been tested by Underwriters Lab or a similar group? Is there a wi fi enabled thermostat that can operate solely on battery power? Not that I know of, unfortunately. Wifi is too power-consuming to get by on battery alone in the long run. emerson sensi. I tried the nest and they lyric, both would not work. I have a 4 wire system, but no common wire. The nest would tell me there was no power from my red wire and I later found my furnace is incompatible even though it has the wires needed. Bought the emerson and haven’t had any issues. You need to make it very clear these are only compatible with 2 wire systems by adding a power supply or replacing 2 conductor cable with 3 or more conductor. I can’t return this expensive RTH9580WF thermostat! 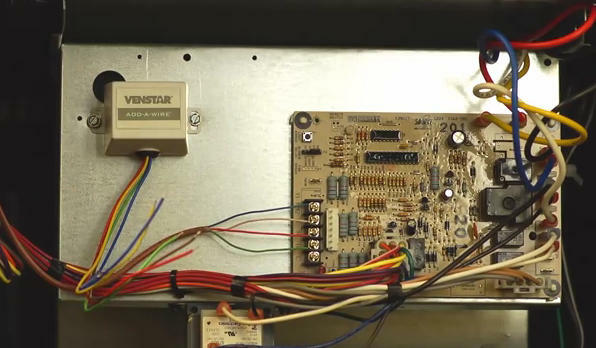 so your saying the be star will only work on thermostats that only have 2 wires hooked to it? I do not have a furnace only a monitor propane wall heater. Used the G wire to hook up my Emerson sensi. Wifi worked for two hours and then stopped. Will this device work on a monitor heater? Didn’t seem to see wire to hook to when I took the cover off. I only have 2 wires for my thermostat that is in a 1987 double wide. Will the constant work with 2 wires? Hows it going my furnace doesnt have a C spot at all would there be another spot that would be the same? I have a T spot!! Thank you!! I have an old fireplace that works on 24v thermostat and there are only 2 wires behind it (R+W). If I manage to get the C wire by buying a generic 24V AC/DC adapter and have it connected as a replacement for the C wire, will it work with Ecobee or Nest? My furnace control board has C-common connection which used for another device power source but not the thermostat . Will that be ok if I use 2 Common wire for one connection on the board. Great info. I bought a wifi thermostat from sensicomfort.com that actually claimed on the website for the exact unit I ordered that it did not require a C wire, only to find that the instructions unequivocally state: you need a c wire. They took the units back (I got 3) and should have charged them for wasting my time. They say “depends on which sensicomfort unit you bought” – and that is to say, if you bought one from sensicomfort.com since they do not sell units that work without batteries without the c wire – for reasons you explain quite clearly. I wish I had seen this post – it’s bookmarked now and now I think I will revisit the wifi thermostat option (which I had given up on). Can I add a C wire with the VENSTAR add a wire kit if I don’t have a Y wire ? I just have a R, W & G wire. Can you show or send me a wiring diagram ? 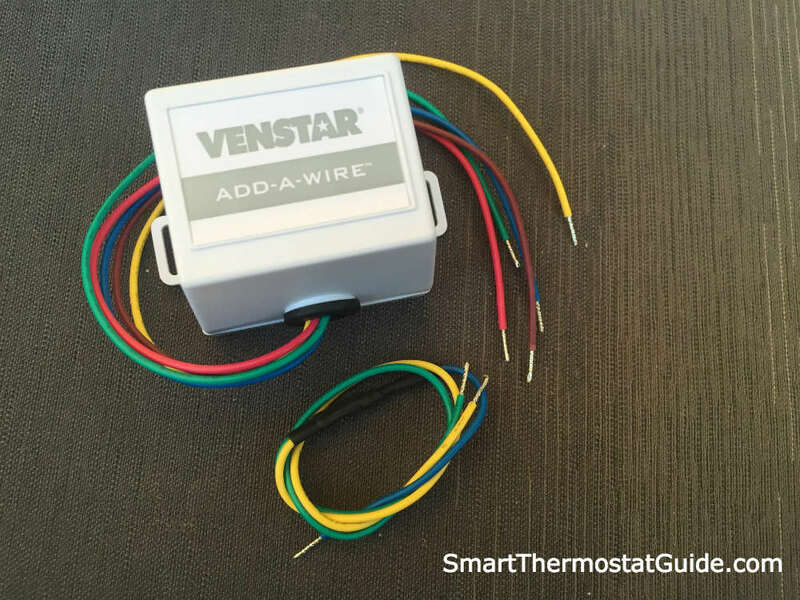 I purchased a Venstar add a wire unit with diode and a Honeywell RTH 9585 WF thermostat. Installation seems straightforward. Currently I have a 4 wire bundle connected from my thermostat to my HVAC without using the C . However, I also have another 2 wire ( red connected at R and white connected at Y) . Do these two wires stay connected as they currently are AFTER I connect the add a wire accessory. Plan to connect 4 existing wires: Thermostat: red to R, white to W, green to C, blue to blue(add a wire diode). HVAC: red to R, white to W, green to C, blue to blue ( add a wire unit). Add a Wire green to G , Add a Wire yellow to Y at both the thermostat and HVAC. I believe the two wire line goes to the transformer. Look forward to your response. Furnace is American Standard , Freedom 95, single stage. If I install the add-a-wire kit, will I be able to run the fan independently? So I see you mentioned that I could use the Venstar C-wire to power my Smart Ecobee 4, but I don’t see the wiring details. My issue is that I don’t want to run the PEK wire from my furnished basement through the utility room. Apparently, there is a lot of cost and hastle. Can I use the following two wire switch with my Ecobee 4 with Alexa?